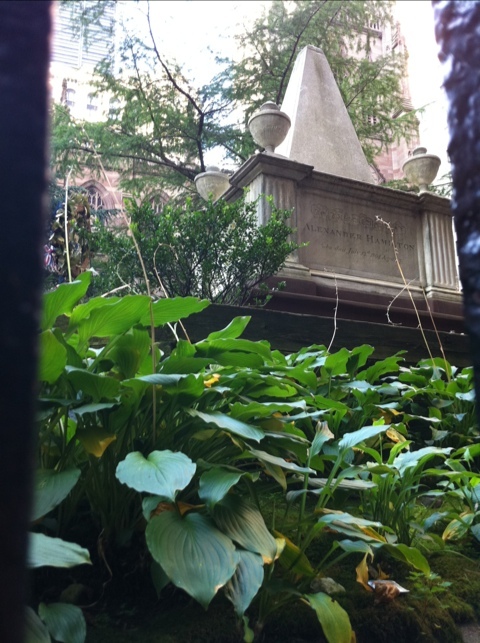 I shot Alexander Hamilton’s final resting place earlier this year, and was impressed with the wholesome hostas surrounding him. These wilting yellowish leaves caught my eye today and, frankly, made me feel better: if the groundskeepers of Trinity Church are having a hard time fighting the heat (or whatever it is that’s causing some cranky vegetation), maybe there’s some green left in my thumb after all. QUESTION: it’s been posed already (thanks Ralph!) but want to put it out there again .. anyone else having a rough a growing season? If so, what do you attribute it to? Is the heat doing us in? Anyone want to argue global warming’s a myth anymore? In 100 degree weather, does it matter? Go ahead … gimme the dirt. In spite of recent threats of thunderstorms by the weatherman I watered my yard today. One of my ‘stalks’ of corn is starting to develop it’s tassels, apparently getting ready to grow an ear of corn. Although initially glad to see that, the ‘stalk’ is even smaller than my sunflowers. At maybe 2 feet tall, I think if I do get an ear or two of corn from it they will probably be more like stir-fry size than the eating with butter size. Surprisingly, since I moved my swiss chard container to where the sun is partially blocked the leaves have been getting bigger. I moved most of my containers from the top of my deck railing to behind the rails where they will get some more shade. Part of the reason was for my excess sun theory, the rest to keep the rail tops dry until I can give them a coat of varnish. The containers periodically get the rail tops wet from watering, or trapping water underneath. I am trying some marine varnish on the rails to help protect them. Once the sun moves tonight I am going to give my test section a second coat. I think it’ll work out better than the usual wood/ deck protector.